This week I’ve got a bunch of goodies for you and a special request at the end. Welcome to the first Tips Tuesday of 2017 y’all!!! Let’s make it a great year!! To help you get the year started on the right foot with your site, I’ve got two incredible specials for you. The deals end at midnight Jan 8, so jump on them now! Site Audit Special – get an extra $20 off on a full site audit. It will help you find all of the security holes and performance drags on your site. You don’t pay for the audit until after it’s complete and we have our live chat. But you do have to get your site audit request in before the deadline. Webmaster Training Special – save $80 off the new Webmaster Level 6 training. It includes all 4 Levels of tutorials, our private Facebook group, which is a gold mine in itself, and free access to our live meetings and webinars. Plus, it includes the all new HTTPS course, which will be the most in-demand skill for designers in 2017. It makes building and converting sites to HTTPS a breeze. Speaking of hot skills for designers, I hope you saw my post yesterday covering all of the tech skills designers need this year. It used to be that a graphic artist could turn designer by learning a little CSS and HTML. Knowing how to properly secure a site from the root up and optimizing it to perform like lightning is required now. So is putting a proper SEO foundation on a site, including making it HTTPS. But learning how to do all of that is tough and time consuming! I know. I had to learn it too. And that’s why I created the Webmaster Training Courses so you don’t have to waste all that time hunting the info you need, or sweating through info so technical you can’t understand it. Less time learning = more time earning, right? That’s just one way the training pays for itself. During the caching plugin tests, I did go ahead and purchase different types of shared hosting on different servers. That really matters as to which plugin will work best for you. The severe ramp up of internet DDoS attacks got in the way of my finishing the ultimate speed tests, but I’ll be right back to those later this month. How did you do with your year-end deadlines? Let us know by leaving a comment here or anywhere you see this post online. But I’m not nearly done with all of the changes I want to make, especially to the Site Success Courses membership. And there are huge changes in store for WordPress too that are going to affect both site owners and designers. I have some ideas in mind for the Site Success Courses membership, but they got blown out of the water by the changes coming for WordPress. So, I started talking to more of my clients to discover what would help them most. I have a several new programs that I will be launching over the next couple of months that came straight out of those conversations. Now I want to hear from more of you so I can continue creating the most helpful content and programs for you. But, I want to hear from everyone! So, I’m inviting my Tips Tuesday peeps too. The whole point of a Town Hall Meeting is to hear from you. So it’s important that you attend live. The replay will only be available to Site Success Courses members, mainly because they need to know what’s happening to their memberships. So, do come if you can and put your $0.02 worth into the mix and help guide the evolution of BlogAid. I really do want to hear from you!! During the holiday week, WordFence and others came out with a post about a PHPMailer vulnerability in the WordPress core. And right behind it, several hosts set their security scanners to look for that issue. Then then began auto emailing site owners about it. I put out a post advising folks to let WP take care of it. The dev who created the PHPMailer has updated his part of it. But WP sure is being slow to release the security update. No actual hack has been seen in the wild for this issue, and it’s not likely that your site is in real danger from it, as the hacker would need to get control of the email address you use on the site. So, I still say wait on that update from WP, or let your host auto fix it, if they have that capability. Well, here it is, January, and Google will be rolling out in-your-face warnings in its Chrome browser for any sites that are collecting passwords or credit card info over an unsecured connection. Meaning, if the site is not HTTPS, it will pop up a warning. That’s the main reason I had to get both of my member sites converted to HTTPS before the end of the year. I’ve got a login bar on every page. The payment gateway was already secured. Nobody knows what date these warnings will start appearing. And I wonder if it will give site owners a warning on their regular WordPress login page. I guess we’ll see, won’t we? Let me know if you see that this month. Well, maybe not. Super post by Rarst about how that stat is calculated. Lately, it’s only been evaluating the top sites according to Alexis ranking. But, when compared to all sites on the web, WP only powers about 7%. Of course, that also includes all 50 million sites on WP.com, 90% of which are abandoned. There’s another neat graph on BuiltWith that shows impressive data about WP usage too. So, nobody knows really what the true percentage is. All you and I know, and all that counts to us, is that WordPress makes our online world go round, right? For those running ads on your site, I came across a post on the Website Magazine site that might interest you. 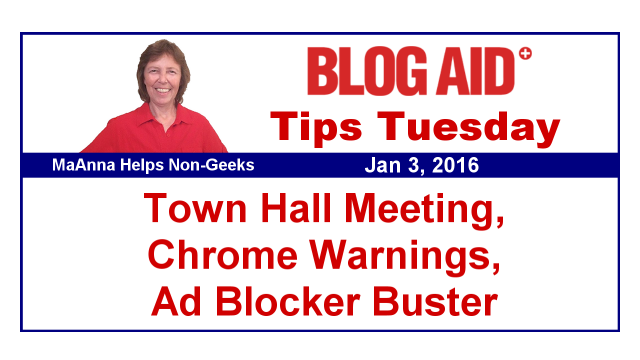 It briefly describes a new ad blocker buster technology called AppShield Ad Integrity. It circumvents ad blockers by enmeshing the site and ad content together. That should make it indistinguishable to ad blockers. Have you ever tried looking at your site with an ad blocker on? Might want to give that a go. And do let us know which ad blocker you’re using. I believe there are several that are browser add-ons. I saw a post last week from John Mueller, the spokesperson for Google, saying that we should be using the standard WordPress robots.txt now. I didn’t trust that advice because I know it is self-serving and Google bots are not the only ones crawling your site, and bots chewing unabated can affect performance. I got into a convo with Joost de Valk (of the Yoast SEO plugin) about it and discovered that he is the primary person requesting changes in the WordPress core for things that affect crawls on the site by search engine bots. Here’s a post he recently re-released on those changes. And some of the WP core trac tickets with the changes made. So, I’ll be updating my recommendation for what should be in your robots.txt file and will update the tutorial for my webmasters on it too. Now, those updates are not strictly in total compliance with Yoast’s suggestions, as his suggestions are still more concerned with Google, Bing, and SEO. My recommendations come from looking at what all bots are doing to a site, not just the search engine crawlers. I’ll also be keeping closer watch on these core trac tickets from now on too. Hey, if you rely on Tips Tuesday to keep on top of your site success, share the love. Share this post with your peeps. If you’re subscribed to the blog posts via email, forward that email to them. Or send them to BlogAid News to subscribe themselves. Visit iTunes and give this podcast a rating! It just takes a minute and means the world to me and to potential listeners that this is a super great resource. Or share this post with your peeps of the best evergreen tips of 2016 and let them see all the goodies in store for them.